I have created a new line of wall that is very dimensional. It looks fabulous, and I have whimsical styles as well as more traditional images. As an added treat, I have included 3-D images of each piece. To view them, you will need the old-fashioned anaglyphic glass such as illustrated here. 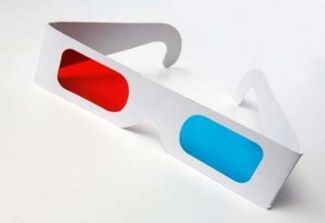 My husband, a long time 3-D fan, thinks that everyone already has several pairs of these glasses lying around. 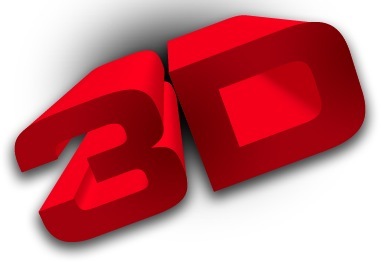 Just between you and me, I know that this is not always the case, so for those who are 3-d-glasses deprived, the traditional 2-D image is also included for each piece. Left: 24KT Rabbit. Three pieces, each with a protruding profile. The rabbit piece protrudes the most and has been decorated with glass enamels. The smaller glass piece is bent and decorated with a carrot. 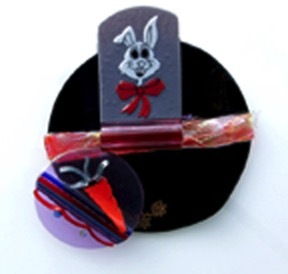 The larger black circle is decorated with lotsa dichroic glass. The ensemble is so cute, a smile is mandatory when you see it! 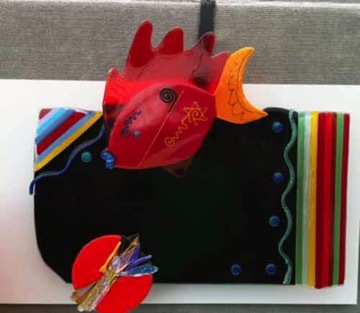 left: This 3 piece 3-D wall sculpture is done with so many designs within a design. There are my glass buttons. hand blown, poured, fused and slumped sculptures. Love making these!